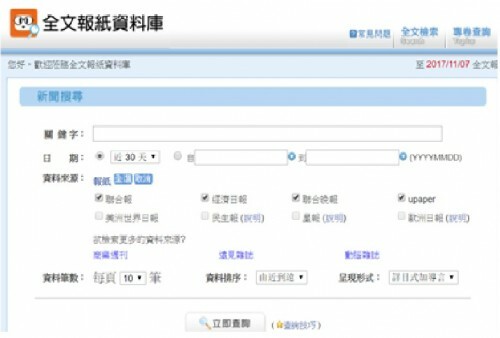 Yale University Library has acquired the access to Udndata 聯合知識庫-全文報紙資料庫. The database allows multiple concurrent users and have been added to the Library’s Quicksearch and Chinese Studies research guide-Newspapers. Information of off-campus access to Yale subscribed electric resources can be found through here. To access Udndata requires NetID authentication and log-in using the account and password listed on a Yale Library page as well as entering the random system-generated “valid code” created for each session on the site. The FAQ of the database is available at http://udndata.com/faq/fulltext.html. Please feel free to contact Michael Meng, Librarian for Chinese Studies, if you have any questions about this resource.